It starts out quite well with a couple of competent hard rockers with an experimental edge that reminds me of King’s X, and even the voice of Paul Kettley bears some resemblance to that of Doug Pinnick. Then comes the first change of style in the shape of ‘The Beating of Black Wings’ which I would venture to place in the dark melodic metal genre. 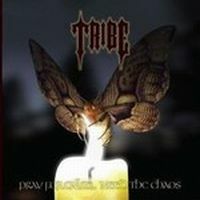 It’s actually one of the strongest tracks on this release and something I would like to hear Tribe do some more of: powerful singing, great riffs and some very good lead work. With the opening of the fifth track ‘Ghost Ballet’, however, the album begins a rather unwelcome and unflattering detour. First with a rock ballad that would have worked better in a Broadway musical, then the rather average hard rocker ‘Milovani’ with some truly ridiculous lyrics, and finally the completely out of place ‘Catch Me’ which could have easily been a single from the latest Robbie Williams album. The rest of the album is a bit of a mixed bag with a couple of strong tracks – the hard rockers ‘Havel’s Hurricane’ and ‘Words That Kill’ are definitely worth a listen – and on the whole I would say that it finishes on a positive note. The band performs well throughout, and singer Kettley certainly does a fine job in every genre he tries his hand at, but this release would definitely have been much stronger if three or four of the weaker tracks had been trimmed. Worth a listen, but more focus next time, please.